Gerhard Jäger, born in born in Jena, Germany, in 1967. Ph.D. from Humboldt University, Berlin, Germany. 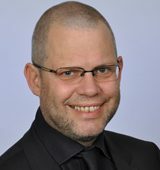 Professor of General Linguistics at Tübingen University. Language change is in many ways analogous to biological evolution. Within the past three decades, computational biology has developed powerful methods to reconstruct evolutionary events from the past. In the project it will be explored if and how these methods are suitable to reconstruct language change as well. Language change involves, inter alia, the systematic replacement of a sound by a different one. This is reflected by regular sound correspondences between related languages, such as the correspondence between “t/s” between Dutch and German: “dat/das”, “water/wasser”, “heet/heiß” etc., where the Dutch version reflects the situation in the common ancestor language and German an innovation. This is comparable to mutations in biology, where a DNA molecule is replaced by a different one. In the project, algorithms from bioinformatics designed to reconstruct mutations will be applied to track historical sound changes. However, while a mutation only affects a single molecule, sound changes affect (modulo conditioning factors) all instances of a sound. Therefore the biological models have to be adapted to the peculiarities of language change. 1) Jäger, G. (2013). Phylogenetic inference from word lists using weighted alignment with empirically determined weights, Language Dynamics and Change 3(2), 245-291. 2) Gong, Tao, Lan Shuai, Mónica Tamariz & Gerhard Jäger (2012). Studying language change using Price equation and Polya-urn dynamics, PLoS ONE 7(3): e33171. 3) Jäger, G. (2007). Evolutionary Game Theory and Typology. A Case Study, Language 83(1), 74-109.